These were for a gathering and I dusted them with cinnamon sugar before baking. It's all about the leftovers, isn't it? When I made this bread I had leftover Cranberry-Apple-Pecan mixture. I froze it, since I am big on the "What do I do with this? I dunno. I'd better toss it in the freezer" method of dealing with things. The paperwork for my taxes is not in my freezer. Luckily, I married a wonderful man whose wonderful mom prepares taxes for a living, otherwise my tax paperwork would be in the freezer with random assorted bags of vegetables and fruits. And Butch. I enjoy the cranberry-citrus combination (and will soon be blessed with Band Fruit Fundraiser citrus, stay tuned for a recipe round up next month) so I decided to add some tangerine to these muffins. I was making up a frightfully orange smoothie (Tangerine-Carrot-Banana) and since I'd gotten the blender out, I blended up a tangerine first for the muffin batter before continuing with the rest of the smoothie. If you're not mixing up a smoothie, just chop up a tangerine and add it to the batter, or get fancy and remove the juicy flesh and toss the scaffolding* in the compost. Alternatively, give the remnants to the composting pig as she'll eat almost anything (her late roommate would eat anything). Don't give it to the worms--they don't care for citrus. 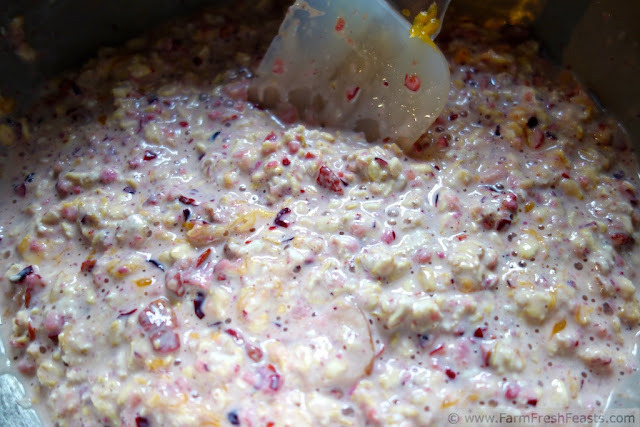 Combine in a large bowl and let soak on the counter for 1 hour up to overnight. cinnamon sugar, optional, to sprinkle across the top after baking. Stir just until blended. Scoop batter into prepared pan. Bake for 12 minutes until tops lightly browned. Sprinkle with cinnamon sugar if desired. Cool 5 minutes in the pan, then flip onto a cooling rack to completely cool. Freezes well. Makes around 32 mini muffins. These were part of a giant batch to give away so I used papers for ease of clean up between panfuls. Pans full. Whatev. *What do you call the walls that separate the flesh of citrus fruit anyway? These remind me of some cranberry apple muffins I made a few weeks ago, but I love your addition of the tangerines. These look delicious! Cranberry and apple is a wonderful combination, and cranberry and orange is a wonderful combination, so I guess I got all kitchen sink-y and combined everything. It worked. Thanks! I hate to waste food, so I am all about the leftover remakes. You can't go wrong with that combination! We forgot to make any breakfast treats this week and my son was appalled that we didn't have any muffins. I quote, "We don't have ANY muffins?! No almond? No cinnamon?" He settled for toast, but we will be making muffins tonight for the rest of the week. We don't have any tangerines, but we do have cranberries and apples – we might be adapting these muffins! Thanks! You are much better to your son than I am to my kids. They are lucky if I make a double batch of waffles on the weekend and pack up the rest for them to rummage and find for breakfast some school days. I think the addition of 2 dogs and the returning spouse have thrown me for a loop. These look amazing, Kirsten. You are the freezer queen! I am clearly not the Dancing Queen. Though I'd throw my pizza stone in the ring to be crowned Pizza Queen, too. I use the same method of freezer storage for things that I don't have a clue what to do with. ;) I wish that I had leftover fruit waiting for me, but my daughter turns everything into a smoothie!! 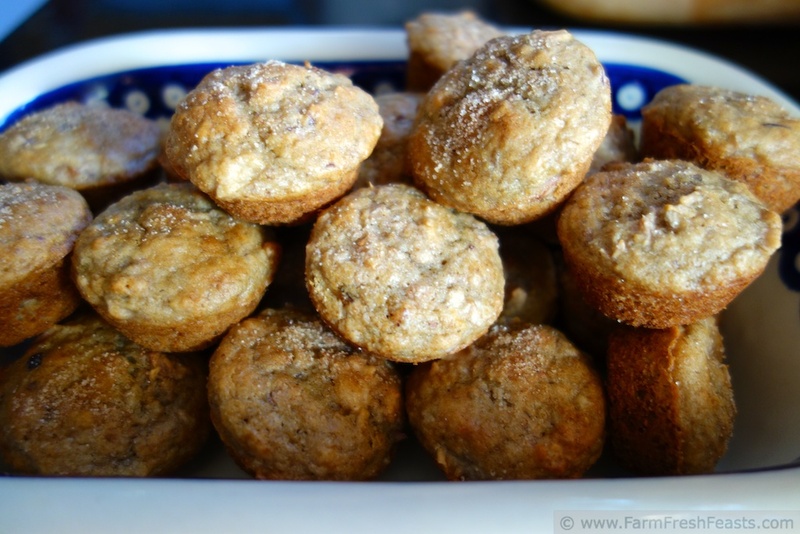 These muffins look wonderful, worthy purchasing new fruit just for the occasion!! This may sound kind of complicated, but bear with me. I've got the little freezer on top of my fridge--that's where bits of leftovers get stashed and where my smoothies are generated from. I've got a small freezer/microwave stand which is the official fruit and veg freezer where I store larger, planned, amounts of things (right now it's got bags of berries, pesto, shredded squash and carrots as well as my Soup Packs). Then I've got a medium sized freezer with our beef. (Someday I'd like a 'hide the body' size freezer, but I doubt that day will come and I really hope this comment comes off sounding like I like to put up food and not like I am a potential axe murderer). 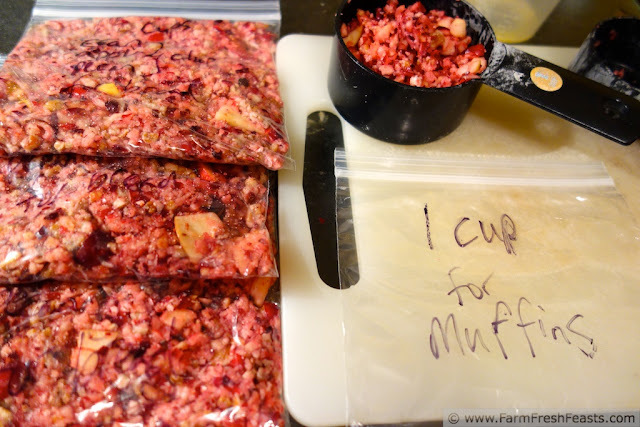 It's great fun to turn whatever's in the littlest freezer (ok, the fruit things) into smoothies, and also great fun to open up the fruit/veg freezer to find muffin fixings. It's just fun to explore in my freezers, period. I'm in the car driving to Buffalo with the Hubby, and I read him the title of this post. His response was, "I want some," and I agree. 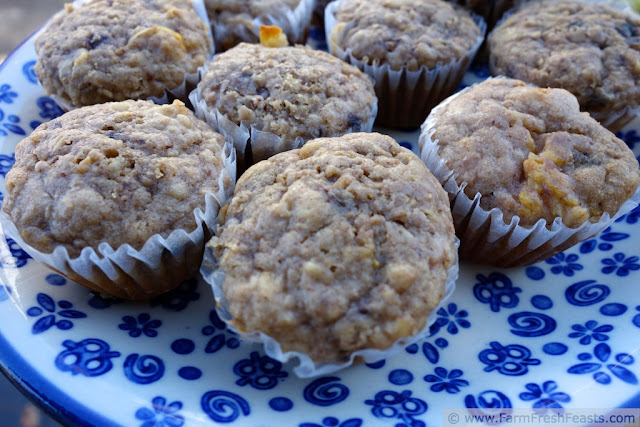 What a wonderful combination of fruit and nuts, all in a lovely muffin. Man, do I love your muffins and also your food philosophy. Matter of fact, I'm pretty sure I've adopted the throw it in the freezer method and figure it out later. It's a solid method. I have no idea what you call the papery layer which houses the orange segments. I'm stumped and therefore will accept scaffolding. Isn't it wonderful to be able to surf the internet while passengering? Is that a word? I'm demonstrating my very poor vocabulary lately.